This is the pedestal obelisk of Pvt. John Carvosso Guerrant in Danville’s Green Hill Cemetery. 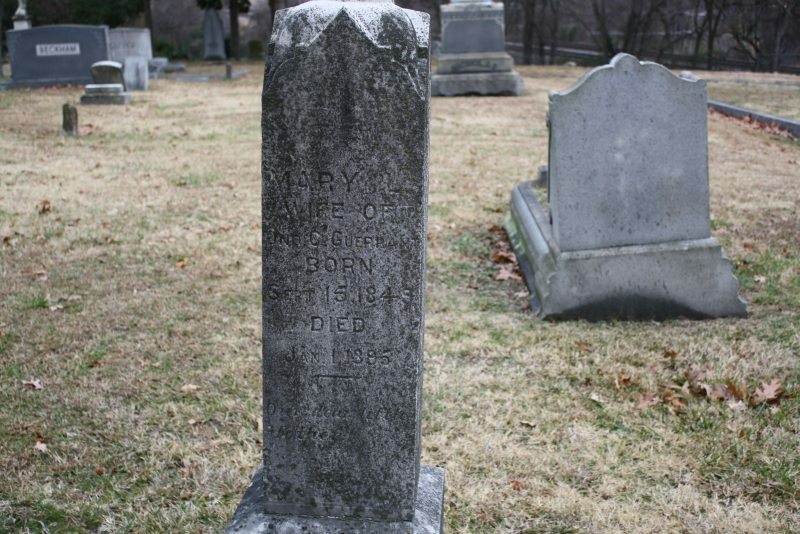 It is situated between the less-detailed obelisk of his wife, Mary Ligon Guerrant, and a small round tablet marker for Lizzie, their 8 year old daughter. At age 21, John’s army career started in the NC’s 13th Infantry Regiment, but he was sent to work in a government gun shop instead of to the battlefield. In that capacity John was able to work on his passion: inventing. He, along with Benton Field, had built a prototype for an engraving machine that landed the pair recognition in the North following the war, but that machine was lost in a fire in 1872. Two of his other notable inventions were an electrical engraver, a tobacco steamer, and a new kind of water meter. There were issues with the creation of prototypes of several of these inventions and on one occasion Collette Leventhorpe (who filed at least one patent with John) referred to him as “unreliable” because he had not followed through with his promise of a water meter prototype. According to the U.S. Patents office’s publication from an appeal on a patent case later in John’s life, he may have had difficulty coming up with the money to build prototypes for some of his machines. At present, little is known to this researcher about John’s personal life. He was born in Pittsylvania County, Virginia, but his parents were born in North Carolina. He married Mary Ligon Hamlin in December 1866 in Rockinham County, North Carolina. On the 1880 census John’s profession is listed as a lumber merchant and the family is living in Danville, Virginia. One source indicates that he and Mary had 8 children: John and Mary (twins), William Roulett (c. 1868), Lucy Hamlin (c. 1870), Peter (1872), Martha (“Pattie”) Reamey (c. 1878), Lizzie (1880), and John Jr.(1884). Several of their offspring are buried in famous Los Angeles area cemeteries such as Forest Lawn and Hollywood Forever, which I found interesting. Because there were two sons named John, it is possible that the first born didn’t survive infancy or childhood, although that is just a hunch at this point. 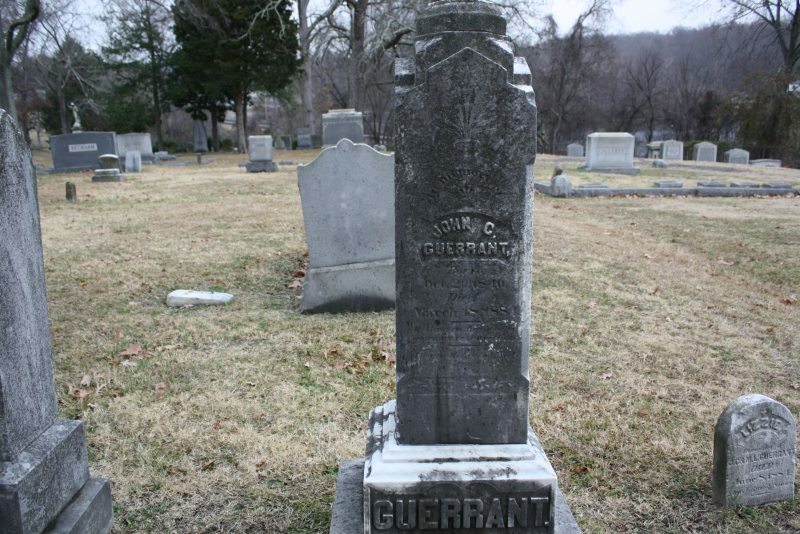 William R. Guerrant also moved to Los Angeles, after living in Danville and Kentucky. It is not certain what caused John’s death at 43, but both he and Lizzie died within a few months of each other. In the case study from the patents office mentioned above it is written that after John’s death Mary was poor and due to that and illness striking the family, she had to move to North Carolina. It’s likely that whatever this illness was ended up killing the father and daughter. Next Next post: "By Foreign Hands Thy Dying Eyes Were Closed"